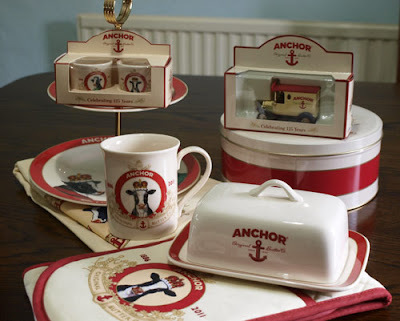 Anchor Butter are celebrating 125 years of butter making this year and I had a message from Doreen the cow asking if I would like some of their celebratory goodies. How could I refuse? So first a box arrived and inside was the lovely mug featuring Doreen herself. Next day the apron and oven gloves arrived, and so it went on, there was at least one more box everyday. I'm not quite sure what the postie thought of that! So here is the final round up of Anchor goodies. Thank you very much Doreen, my son has just moved into a new flat so he got most of this stash although I did keep the tiered cake plate and put the little car away for my grandson when he gets older. Such awesome goodies. 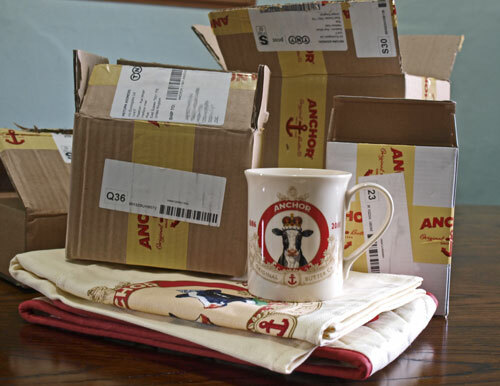 I want some too :) I love anchor butter and use it for my bakes. I tend to buy them by the dozen as I use so much butter! Wow lucky you! I love the butter dish! Oh and I love Anchor butter too!